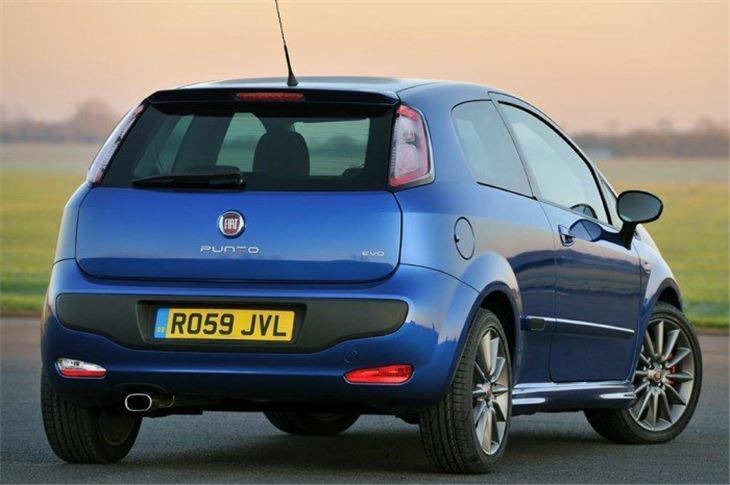 Martin Gurdon writes: The ongoing fuss about Fiat’s cute 500 baby car has rather obscured some of its other products, like the Grande Punto hatchback, which has just been given a serious design workover and re-named the Grande Punto Evo. 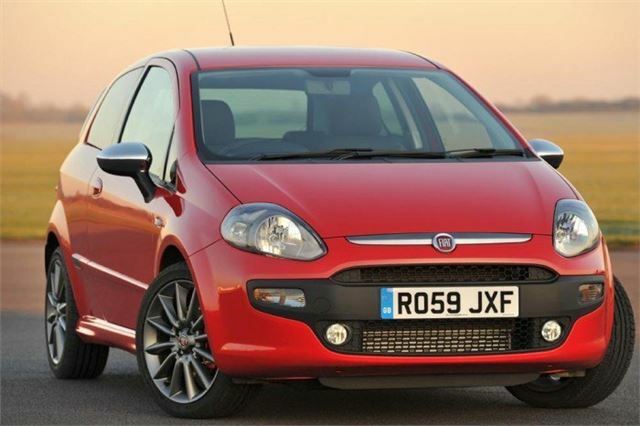 The three and five-door car has been around since 2006, and whilst it might not have its baby brother’s cachet, it’s played a big part in Fiat hauling itself out of the mire, and is claimed to be Europe’s fifth best-selling model. 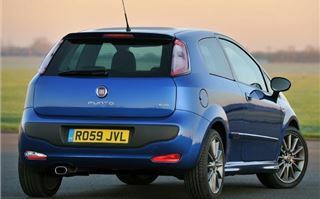 The new one is called the Grande Punto Evo, which doesn’t mean that it’s madly sporting (although, unsurprisingly, the Sporting version is, in a civilised way), but Fiat is claiming that the latest cars go very well thanks to a new range of petrol engines. It’s christened these MultiAir (to go with its MultiJet diesels, which have also been improved for the latest Punto), and features a complex mix of electronics and hydraulics to make the air intake valves of the Evo’s 1,400cc, 16-valve motors work more efficiently. The idea is that the electronics monitor how much the air intake valves need to open for an efficient fuel/air mix, so that they perform better and emit less CO2, a process helped by stop/start systems being fitted to the cars as standard. Across the range (there are 105 and 135bhp versions) this equates to a claimed CO2 cut of 10 per cent, another 10 per cent boost for power outputs and a 15 per cent rise in torque, or pulling power, which is useful in higher gears, and makes the cars feel more relaxed. This technology is also claimed to clean up the car’s broader emissions when it’s started from cold –a period when it’s at its dirtiest- a process helped by re-circulating rather than chucking out exhaust gases whilst the catalyst warms up to operating temperature. 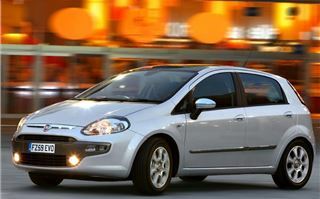 The new engines, whose technology will eventually find its way into the rest of Fiat’s petrol range, certainly go well. Colleagues felt that the smaller versions had the nicest power delivery characteristics, but interestingly, the 135bhp Sporting we tried, which uses a turbocharger, and is capable of almost 130mph and reaches 62 in 8.5 secs, produces less CO2 (129g/per km as opposed to 134) and it’s claimed combined mpg of 50.4 is fractionally better too. Apparently the turbo helps it to not only go better, but burn its fuel more effectively too. With a lot of power to get through the front wheels, the Sporting goes about its business with very little fuss. Under hard acceleration the steering wheel doesn’t writhe about, and the power is delivered in a smooth, progressive surge, via the slightly rubbery five-seed gearbox. At motorway speeds the engine sounds busier than it is, with 3,500rpm equating to about 85mph, but it’s not especially intrusive, and has an impressive spread of torque, allowing for rapid overtaking simply by planting your foot on the throttle. For a short thing with fat tyres and sports suspension, it rode well too; firm, without being teeth-rattlingly harsh. 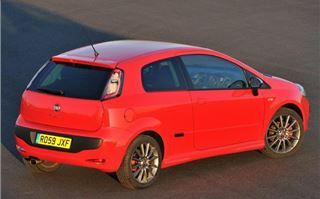 The handling is tidy, taught and precise, the electric power steering quick and direct, but curiously lifeless. 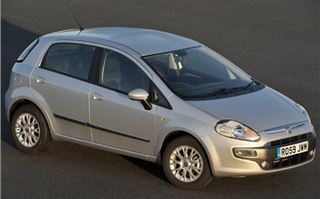 The wider Punto range has undergone a lot of changes. Bodies are stiffer, suspension bushes revised, sound deadening changed, and to let people know these cars are new, Fiat has endowed them with revised tail lamps and a re-profiled the grill and headlamps. The nose job is OK, but fussier and less pleasing than the old model, which survives for the time being as an entry level product. A chrome flash on the Evo’s nose is presumably intended to echo the 500’s but actually looks like a Village People-era moustache. If the front looks very slightly worse, the inside is a whole lot better. The old car’s cabin was pleasant and perfectly serviceable, but this one, with its new seats, nicer trim materials, swoopy facia and re-styled instruments, is simply more attractive, and certainly doesn’t feel cheap or expedient. Actually, it’s rather classy. 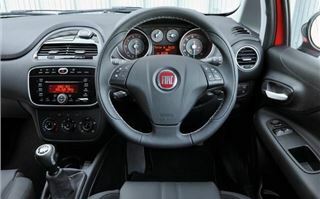 Design features include a detachable TomTom sat-nav, which can control a lot of the car’s functions and will commune with its Blue&Me telematics system, which also make use of steering wheel buttons. Other notable bits of kit include a pair of rear headrests, daytime running lights, knee height airbags and a hill assist device. All this is good stuff. 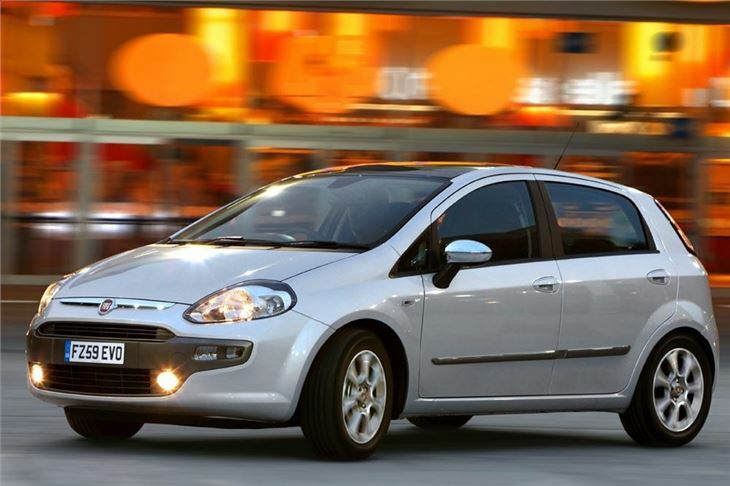 Less good for bigger drivers is the slightly narrow footwell, one or two blind spots in the three door, notably right hand B-pillar, which gets in the way at junctions, and some wind noise at motorway speeds. 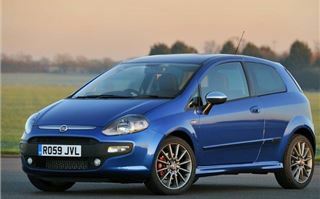 Still, whist it might not have the Ford Fiesta’s class-leading road manners, the Punto Evo is an engaging, capable and well thought out and equipped smallish car and a genuine improvement over its predecessor. 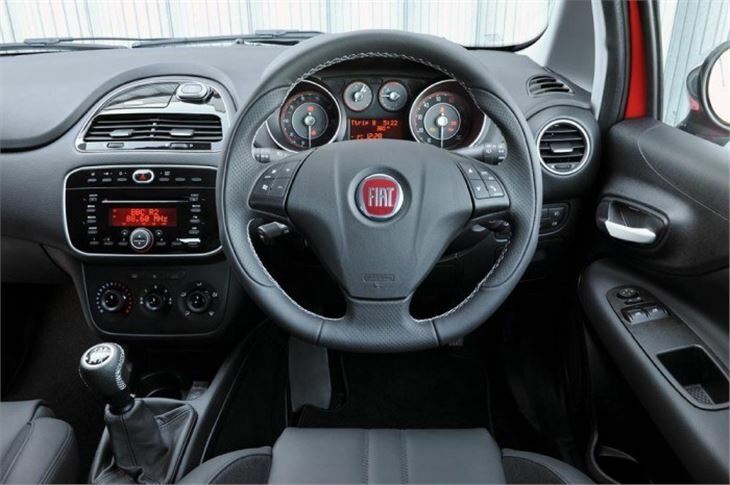 The new engines endow it with lively performance, and its build quality is very different from Fiats of yore –in a good way. 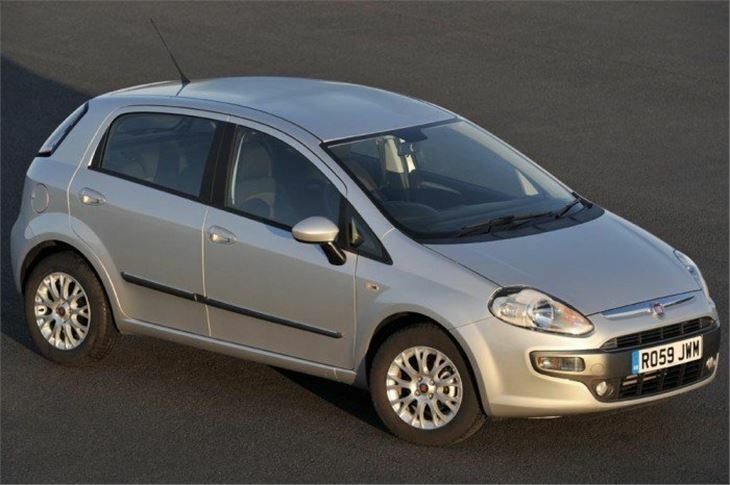 With official on-the-road prices starting at £13,095, the Punto Evo MultiAir is expensive (entry level Punto Actives with the older, eight-valve 1.4 engines cost £2,100 less), but a quick internet search revealed dealers offering fat discounts on these cars –just like everyone else.